This Day In History: November 18, 326 C.E. Ever since the apostle Peter was crucified in Rome during the reign of Nero in 65 C.E., Christians have venerated the spot where he was martyred and buried. Peter had only been dead a few decades when Pope Anacletus built an oratory over his tomb to honor the deceased saint. When Constantine came to power in the fourth century and made Christianity the state religion of the Roman Empire, he ordered a lavish basilica to be built on that spot. The emperor himself laid the foundation for the building in 315 C.E. No expense was spared – the church was bedecked with exquisite marble adornments, mosaics and rare jewels; rich tapestries and draperies adorned the magnificent interior spaces. 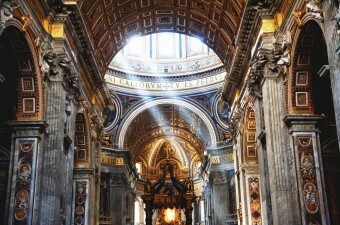 The flooring covering the tomb of St. Peter was shimmering silver and gold. Pope Silvester I consecrated the basilica on November 18, 326 C.E. 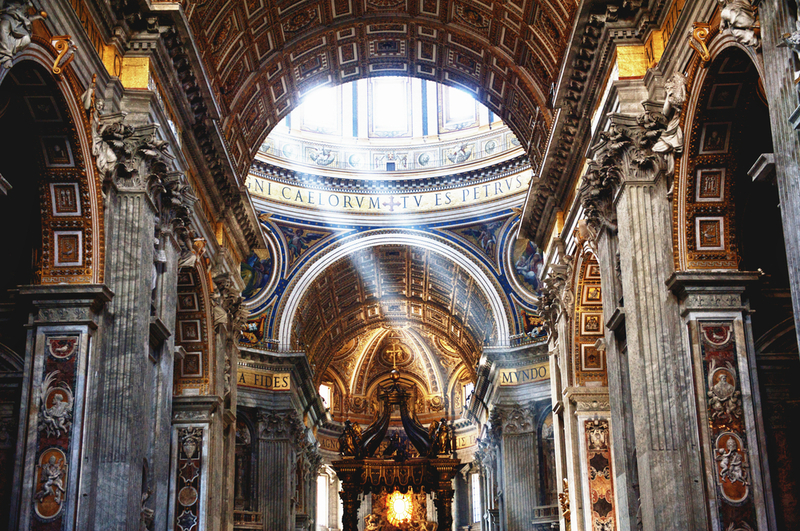 For over 1,000 years, pilgrims flocked to St. Peter’s Basilica to venerate the relics of the first pope and to stand in awe of the grandeur of his church. The building eventually became structurally unsound after over a millennium of service, and Pope Julius II ordered a new church to be built in 1506. The church took over 130 years to build, but with a team of architects like Bramante, Raphael, Michelangelo, Maderno, and Bernini on the job, it was well worth the wait. The Basilica contains iconic masterpieces including the Pieta of Michelangelo, the Vatican grottos and the Sistine Chapel. Many other priceless works of art are housed in the Vatican Museums. In addition to being the world’s largest church and one of Rome’s major tourist attractions, St. Peter’s Basilica is also an active house of worship. Masses are said throughout the day, and confessions, baptisms, weddings, and funerals are held here like any other Catholic church. Except at this Catholic church, the Pope canonizes new saints and elevates new candidates to the College of Cardinals. The first and Second Vatican councils took place here as well, which also sets St. Peter’s Basilica apart from your typical parish church. How is the Pope Chosen? What a breath of fresh air! FINALLY, after years of reading at “Today I Found Out,” I have come across an article about a facet of Catholicism that is not ANTI-Catholic (!) — and, what’s more, it was written by someone who has made MANY anti-Catholic comments in the past! I just pray that she has undergone an awakening and will make a new trend of the respect shown on this page. Nevertheless, the article contains one factual error — a mistake that I have previously encountered in the writings of anti-Christians or anti-Catholics.